3 Where did the term “spam” come from? 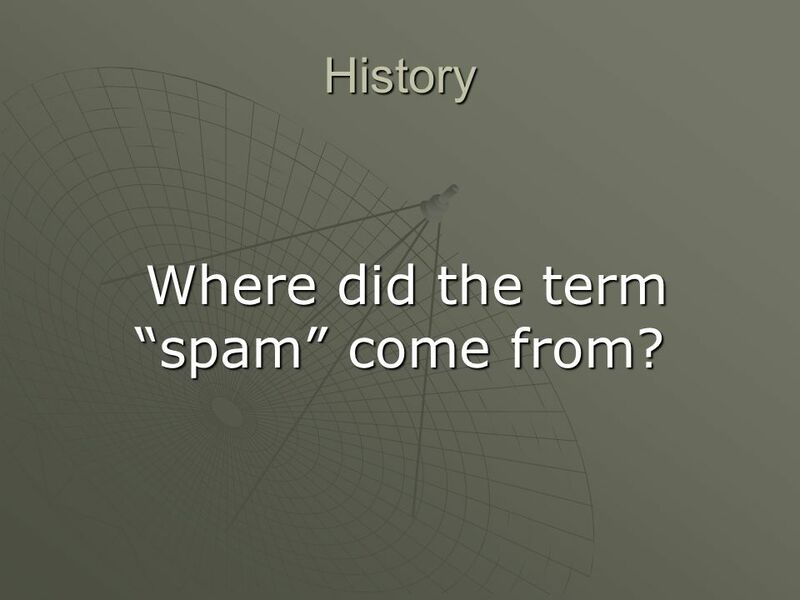 History Where did the term “spam” come from? "Spam" is a popular Monty Python sketch, first broadcast in In the sketch, two customers are trying to order a breakfast from a menu that includes the processed meat product in almost every item. The term spam (in electronic communication) is derived from this sketch. 4 SPiced hAM Spam was one of the few meat products excluded from the British food rationing that began in World War II (and continued for a number of years after the war), and the British grew heartily tired of it. 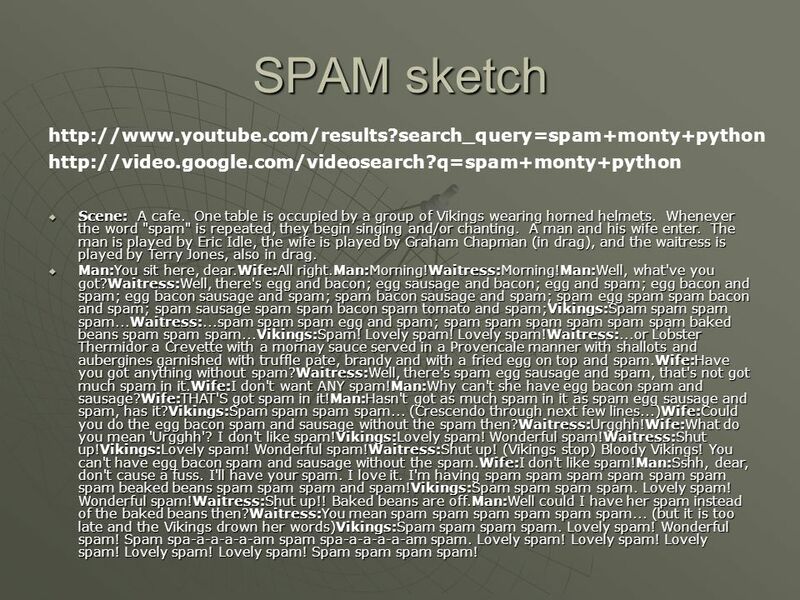 The Monty Python comedy troupe used this as the context for their Spam sketch, in which the menu at a greasy spoon cafe consists entirely of dishes containing one or more portions of spam. Introduced on July 5, 1937, the name "Spam" was chosen in the 1930s when the product, whose original name was far less memorable (Hormel Spiced Ham), began to lose market share. The name was chosen from multiple entries in a naming contest. 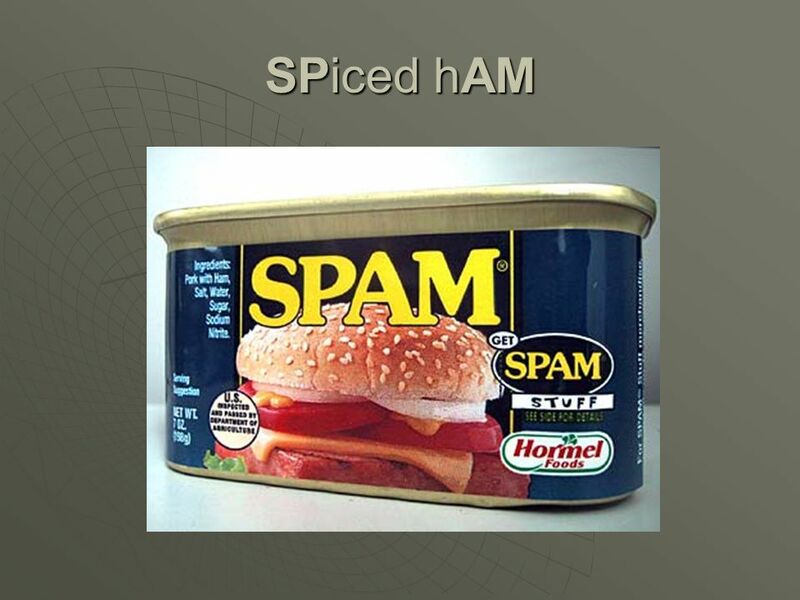 A Hormel official once stated that the original meaning of the name spam was "Shoulder of Pork and hAM". According to writer Marguerite Patten in Spam – The Cookbook, the name was suggested by Kenneth Daigneau, an actor and the brother of a Hormel vice president. The current official explanation is that the name is a syllabic abbreviation of "SPiced hAM", and that the originator was given a $100 prize for coming up with the name. SPAM is sold in over 99% of grocery stores in the United States. As of 1997, over 5 billion tins had been sold worldwide. 5 SPAM sketch Scene: A cafe. One table is occupied by a group of Vikings wearing horned helmets. Whenever the word "spam" is repeated, they begin singing and/or chanting. A man and his wife enter. The man is played by Eric Idle, the wife is played by Graham Chapman (in drag), and the waitress is played by Terry Jones, also in drag. Man:You sit here, dear.Wife:All right.Man:Morning!Waitress:Morning!Man:Well, what've you got?Waitress:Well, there's egg and bacon; egg sausage and bacon; egg and spam; egg bacon and spam; egg bacon sausage and spam; spam bacon sausage and spam; spam egg spam spam bacon and spam; spam sausage spam spam bacon spam tomato and spam;Vikings:Spam spam spam spam...Waitress:...spam spam spam egg and spam; spam spam spam spam spam spam baked beans spam spam spam...Vikings:Spam! Lovely spam! Lovely spam!Waitress:...or Lobster Thermidor a Crevette with a mornay sauce served in a Provencale manner with shallots and aubergines garnished with truffle pate, brandy and with a fried egg on top and spam.Wife:Have you got anything without spam?Waitress:Well, there's spam egg sausage and spam, that's not got much spam in it.Wife:I don't want ANY spam!Man:Why can't she have egg bacon spam and sausage?Wife:THAT'S got spam in it!Man:Hasn't got as much spam in it as spam egg sausage and spam, has it?Vikings:Spam spam spam spam... (Crescendo through next few lines...)Wife:Could you do the egg bacon spam and sausage without the spam then?Waitress:Urgghh!Wife:What do you mean 'Urgghh'? I don't like spam!Vikings:Lovely spam! Wonderful spam!Waitress:Shut up!Vikings:Lovely spam! Wonderful spam!Waitress:Shut up! (Vikings stop) Bloody Vikings! You can't have egg bacon spam and sausage without the spam.Wife:I don't like spam!Man:Sshh, dear, don't cause a fuss. I'll have your spam. I love it. I'm having spam spam spam spam spam spam spam beaked beans spam spam spam and spam!Vikings:Spam spam spam spam. Lovely spam! Wonderful spam!Waitress:Shut up!! Baked beans are off.Man:Well could I have her spam instead of the baked beans then?Waitress:You mean spam spam spam spam spam spam... (but it is too late and the Vikings drown her words)Vikings:Spam spam spam spam. Lovely spam! Wonderful spam! Spam spa-a-a-a-a-am spam spa-a-a-a-a-am spam. Lovely spam! Lovely spam! Lovely spam! Lovely spam! Lovely spam! Spam spam spam spam! "Spam" is a popular Monty Python sketch, first broadcast in In the sketch, two customers are trying to order a breakfast from a menu that includes the processed meat product in almost every item. The term spam (in electronic communication) is derived from this sketch. Scene: A cafe. One table is occupied by a group of Vikings wearing horned helmets. Whenever the word "spam" is repeated, they begin singing and/or chanting. A man and his wife enter. The man is played by Eric Idle, the wife is played by Graham Chapman (in drag), and the waitress is played by Terry Jones, also in drag. Man:You sit here, dear. Wife:All right. Man:Morning! Waitress:Morning! Man:Well, what've you got? Waitress:Well, there's egg and bacon; egg sausage and bacon; egg and spam; egg bacon and spam; egg bacon sausage and spam; spam bacon sausage and spam; spam egg spam spam bacon and spam; spam sausage spam spam bacon spam tomato and spam; Vikings:Spam spam spam spam... Waitress:...spam spam spam egg and spam; spam spam spam spam spam spam baked beans spam spam spam... Vikings:Spam! Lovely spam! Lovely spam! Waitress:...or Lobster Thermidor a Crevette with a mornay sauce served in a Provencale manner with shallots and aubergines garnished with truffle pate, brandy and with a fried egg on top and spam. Wife:Have you got anything without spam? Waitress:Well, there's spam egg sausage and spam, that's not got much spam in it. Wife:I don't want ANY spam! Man:Why can't she have egg bacon spam and sausage? Wife:THAT'S got spam in it! Man:Hasn't got as much spam in it as spam egg sausage and spam, has it? Vikings:Spam spam spam spam... (Crescendo through next few lines...) Wife:Could you do the egg bacon spam and sausage without the spam then? Waitress:Urgghh! Wife:What do you mean 'Urgghh'? I don't like spam! Vikings:Lovely spam! Wonderful spam! Waitress:Shut up! Waitress:Shut up! (Vikings stop) Bloody Vikings! You can't have egg bacon spam and sausage without the spam. Wife:I don't like spam! Man:Sshh, dear, don't cause a fuss. I'll have your spam. I love it. I'm having spam spam spam spam spam spam spam beaked beans spam spam spam and spam! Vikings:Spam spam spam spam. Lovely spam! Wonderful spam! Waitress:Shut up!! Baked beans are off. Man:Well could I have her spam instead of the baked beans then? Waitress:You mean spam spam spam spam spam spam... (but it is too late and the Vikings drown her words) Vikings:Spam spam spam spam. Lovely spam! Wonderful spam! Spam spa-a-a-a-a-am spam spa-a-a-a-a-am spam. Lovely spam! Lovely spam! Lovely spam! Lovely spam! Lovely spam! Spam spam spam spam! 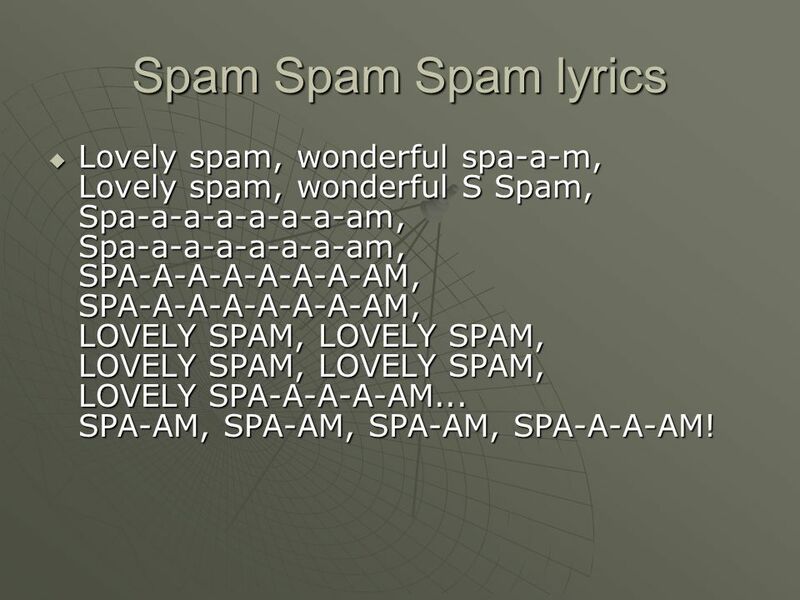 6 Spam Spam Spam lyrics Lovely spam, wonderful spa-a-m, Lovely spam, wonderful S Spam, Spa-a-a-a-a-a-a-am, Spa-a-a-a-a-a-a-am, SPA-A-A-A-A-A-A-AM, SPA-A-A-A-A-A-A-AM, LOVELY SPAM, LOVELY SPAM, LOVELY SPAM, LOVELY SPAM, LOVELY SPA-A-A-A-AM... SPA-AM, SPA-AM, SPA-AM, SPA-A-A-AM! 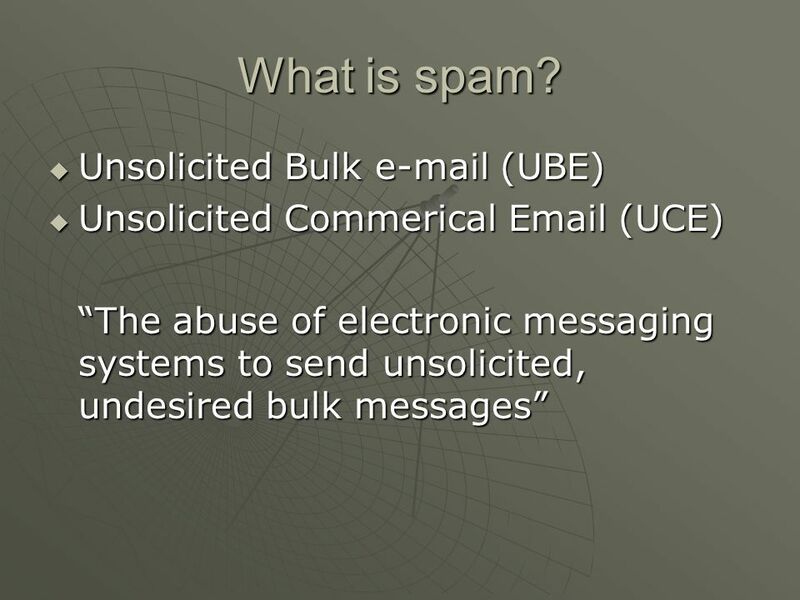 Unsolicited Commerical (UCE) “The abuse of electronic messaging systems to send unsolicited, undesired bulk messages” Spamming is economically viable because advertisers have no operating costs beyond the management of their mailing lists, and it is difficult to hold senders accountable for their mass mailings. Because the barrier to entry is so low, spammers are numerous, and the volume of unsolicited mail has become very high. The costs, such as lost productivity and fraud, are borne by the public and by Internet service providers, which add extra capacity to cope with the deluge. 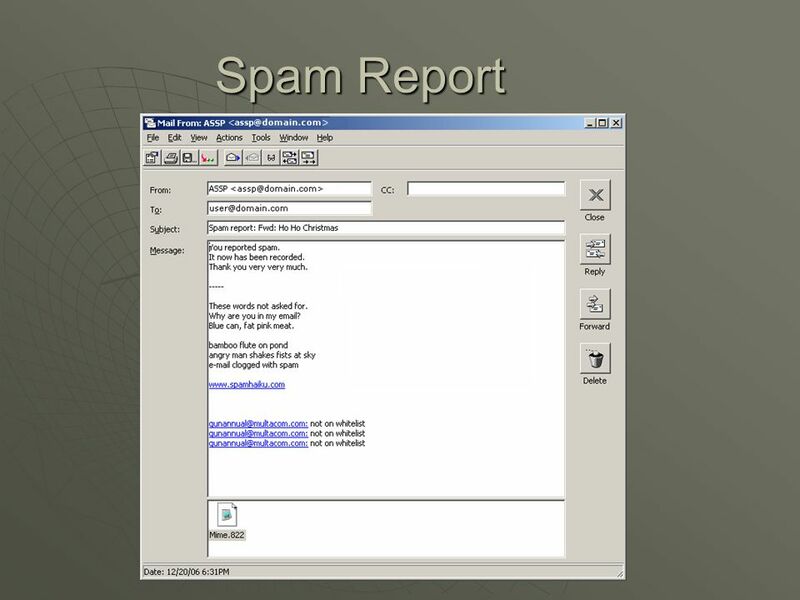 Spamming is widely reviled, and has been the subject of legislation in many jurisdictions. 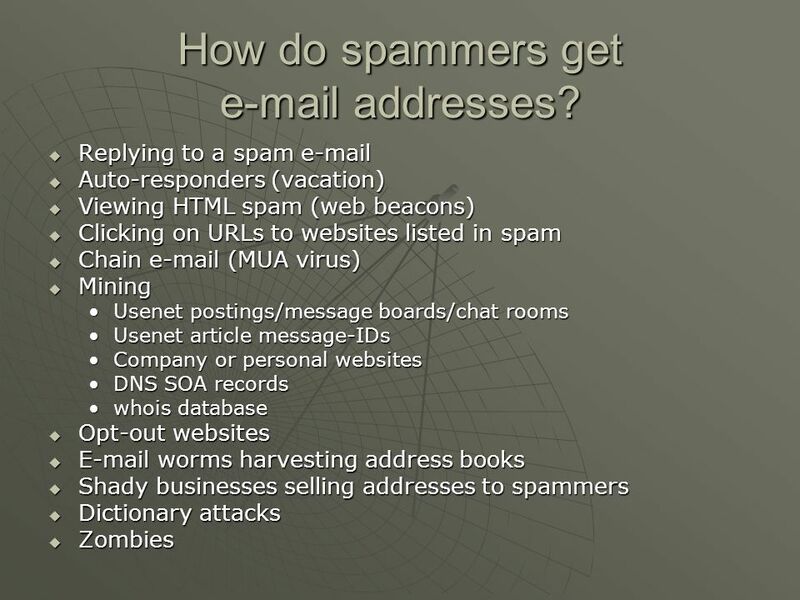 9 How do spammers get e-mail addresses? 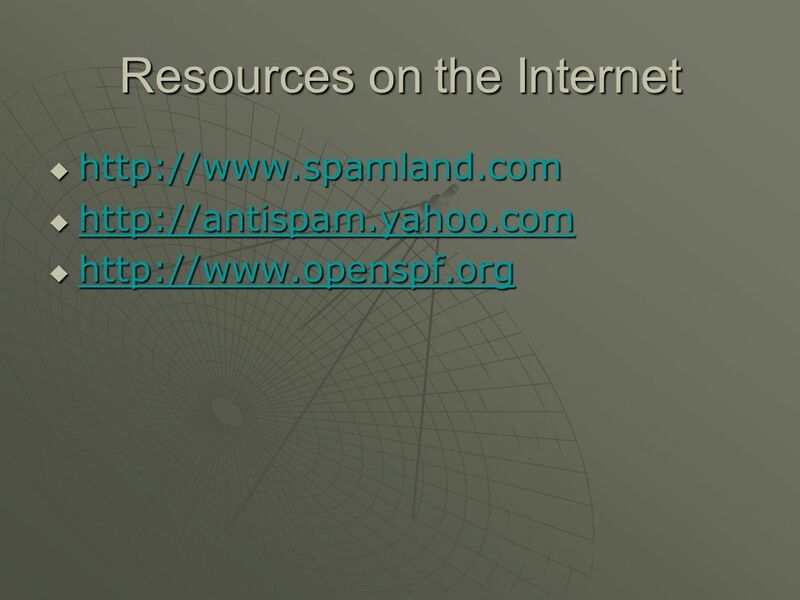 Replying to a spam Auto-responders (vacation) Viewing HTML spam (web beacons) Clicking on URLs to websites listed in spam Chain (MUA virus) Mining Usenet postings/message boards/chat rooms Usenet article message-IDs Company or personal websites DNS SOA records whois database Opt-out websites worms harvesting address books Shady businesses selling addresses to spammers Dictionary attacks Zombies Chain may seem fairly harmless, for example, a grammar school student wishing to see how many people can receive his for a science project, but can grow exponentially and be hard to stop. They may contain false information, such as the famous "Forward this to everyone you know and if it reaches 1000 people everyone on the list will receive $1000" type s. They may also be politically motivated, such as "save the scouts, forward this to as many friends as possible". Some recent chain s say that a company "will stop its free service if you don't send this message to X people". Some threaten users with bad luck if not forwarded. 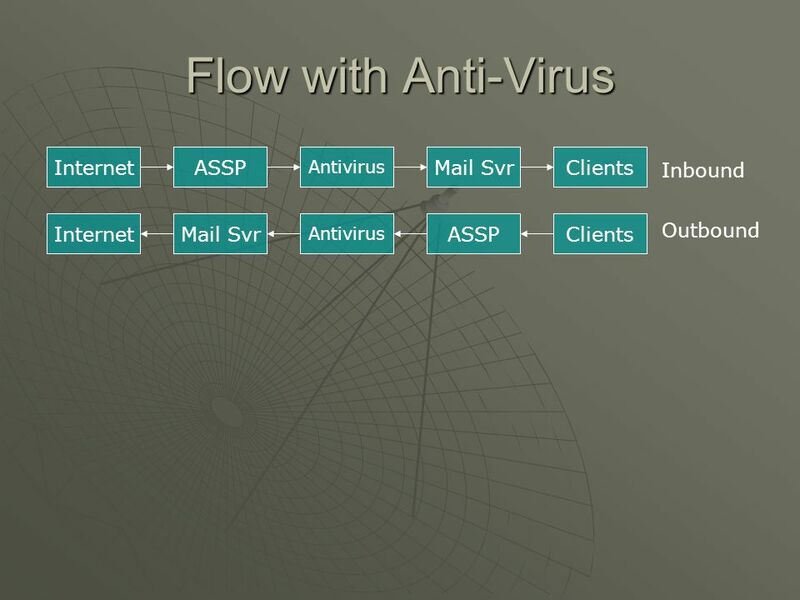 Forwarding chain may increase a user's risk of getting viruses, and may also increase the amount of spam received, since participant's addresses are sometimes visible and may end up in the hands of spammers, either directly or via mailing lists archives on the web. s that are forwarded simply because they are enjoyed, such as urban legends or jokes are not necessarily under the chain category, although some chain is obviously humorous. Likewise, most spam is not chain as it doesn't typically ask recipients to forward the to friends. 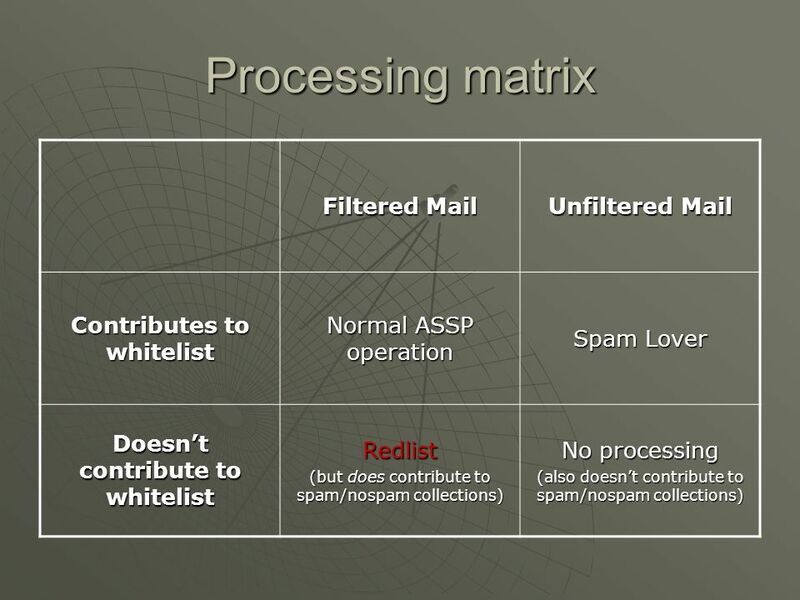 A list of addresses which would generally never send you spam Blacklisting A list of addresses or domains you do not wish to receive any from Greylisting Temporarily reject an unknown by imposing a fixed delay before accepting (ASSP calls this Delaying due to a name conflict) Redlisting Keeps an address off the whitelist Greylisting: is delayed. The idea is that If the mail is legitimate, the originating server will try again to send it later, at which time the destination will accept it. If the mail is from a spammer, it will probably not be retried, and spam sources which re-transmit later are more likely to be listed in DNSBLs and distributed signature systems such as Vipul's Razor before the delay expires. Greylisting keeps track of a “tuple” (three things) in a database: 1) IP address of connecting host 2) envelope sender address 3) envelope recipient address Greylisting works best when used with other spam prevention techniques like DNS Black Lists and Spam signature databases ASSP Greylist: ASSP collects statistics from participating ASSP users to help identify mail hosts that tend to send more spam or more not-spam mail. These statistics are compiled together to create a "greylist." The greylist associates IP addresses of mail sending hosts with their recent statistical probability of sending spam or not spam. It's not a whitelist, or a blacklist, but somewhere in-between -- a grey list. Of course it is rare to find a host that sends equal amounts of spam and not-spam, so very few entries are 50/50 or completely grey. This type of information is of practically no value to traditional IP-based spam-blocking systems. However, it is ideal for a Bayesian descriminator: this probability is factored in with other probabilities associated with the mail and helps affect the outcome in the desired way -- better spam AND not-spam detection. 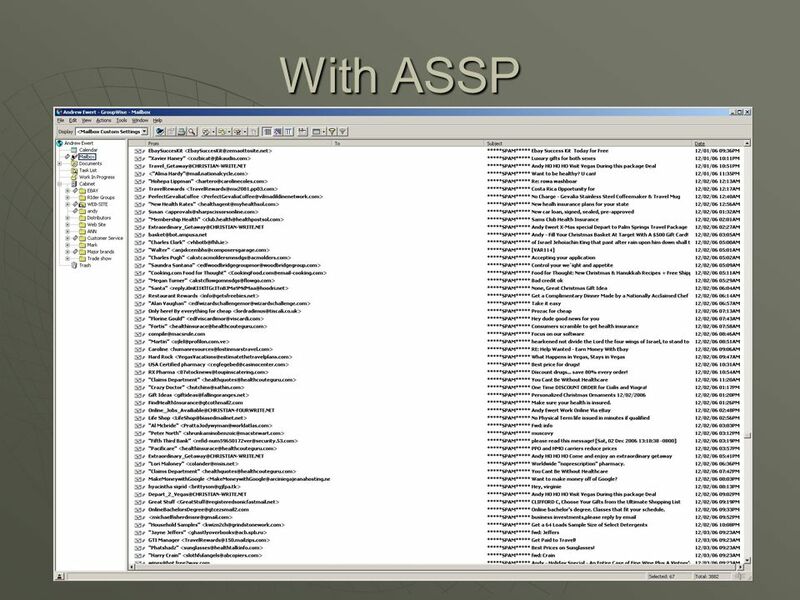 ASSP downloads it about every 12 hours. There's no point in downloading it more frequently than that. 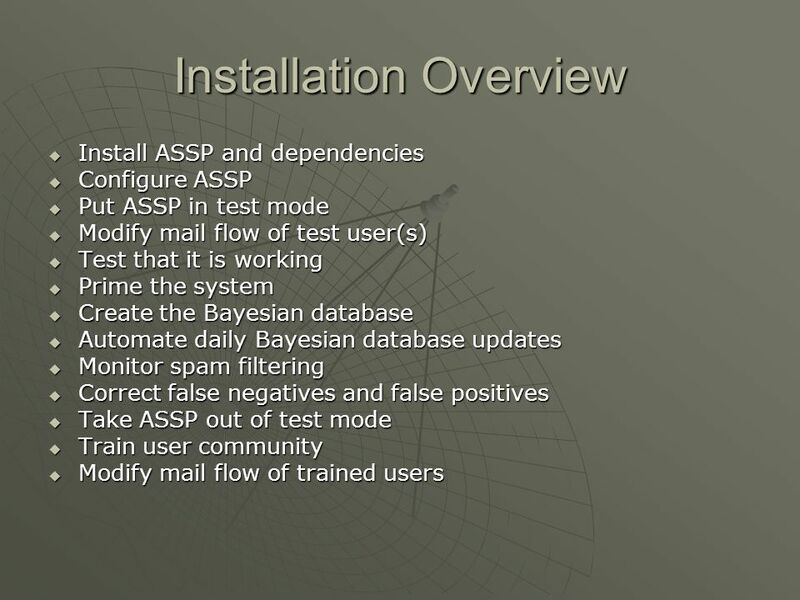 MTA MUA SMTP Bayesian spam filtering (pronounced "Bays-ee-en", after Rev. Thomas Bayes) is a form of filtering, is the process of using Bayesian statistical methods to classify documents into categories Bayesian poisoning is a technique used by spammers in an attempt to degrade the effectiveness of spam filters that rely on Bayesian filtering. A spammer practicing Bayesian poisoning will send out s with large amounts of legitimate text (gathered from legitimate news or literary sources). 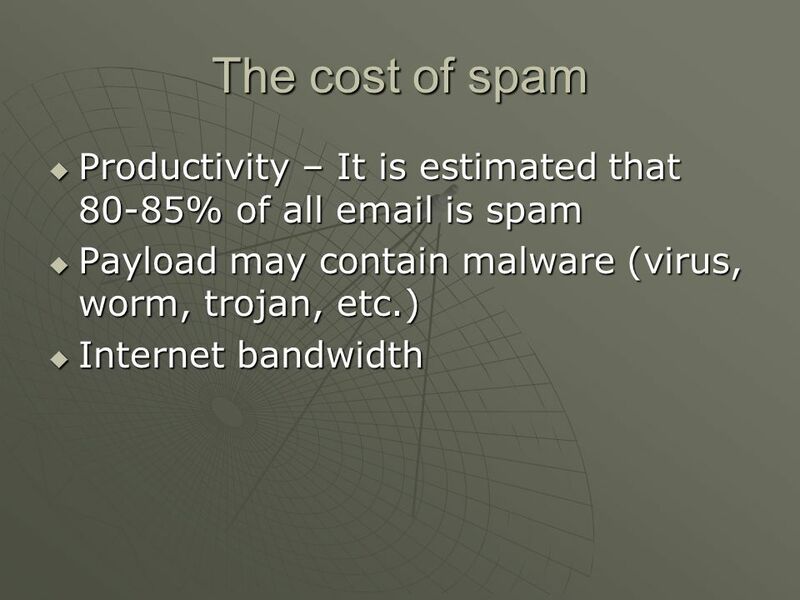 The advantage of Bayesian spam filtering is that it can be trained on a per-user basis. 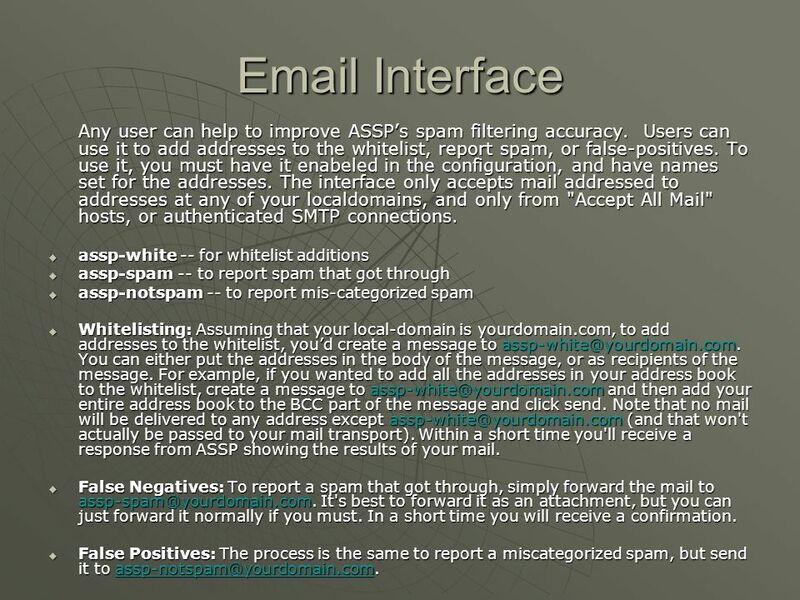 The spam that a user receives is often related to the online user's activities. For example, a user may have been subscribed to an online newsletter that the user considers to be spam. This online newsletter is likely to contain words that are common to all newsletters, such as the name of the newsletter and its originating address. A Bayesian spam filter will eventually assign a higher probability based on the user's specific patterns. The legitimate s a user receives will tend to be different. For example, in a corporate environment, the company name and the names of clients or customers will be mentioned often. The filter will assign a lower spam probability to s containing those names. The word probabilities are unique to each user and can evolve over time with corrective training whenever the filter incorrectly classifies an . 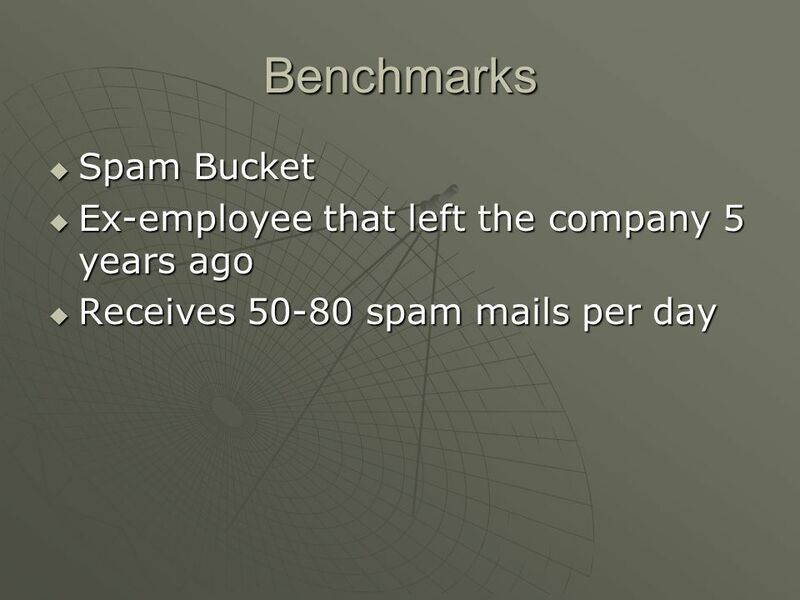 As a result, Bayesian spam filtering accuracy after training is often superior to pre-defined rules. 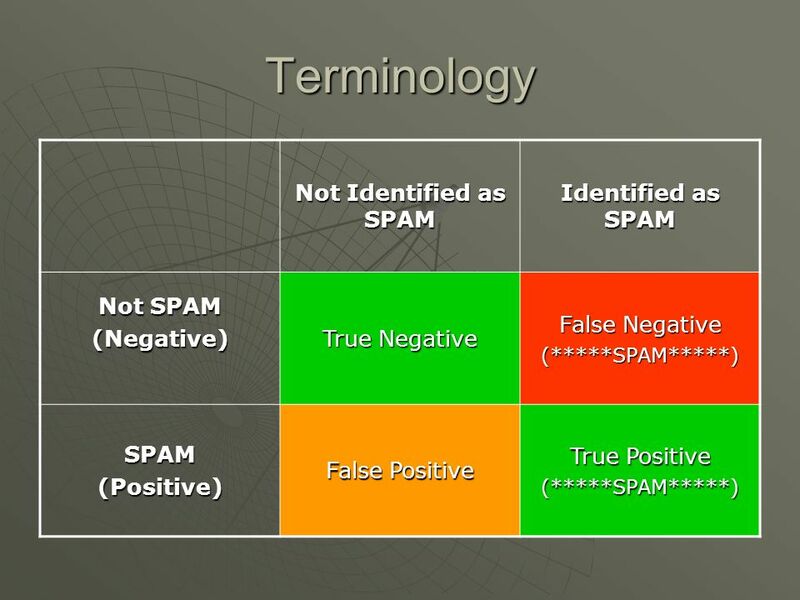 It can perform particularly well in avoiding false positives, where legitimate is incorrectly classified as spam. For example, if the contains the word "Nigeria", which frequently appeared in a long spam campaign, a pre-defined rules filter might reject it outright. A Bayesian filter would mark the word "Nigeria" as a probable spam word, but would take into account other important words that usually indicate legitimate . For example, the name of a spouse may strongly indicate the is not spam, which could overcome the use of the word "Nigeria.“ Some spam filters combine the results of both Bayesian spam filtering and pre-defined rules resulting in even higher filtering accuracy. Recent spammer tactics include insertion of random innocuous words that are not normally associated with spam, thereby decreasing the 's spam score, making it more likely to slip past a Bayesian spam filter. 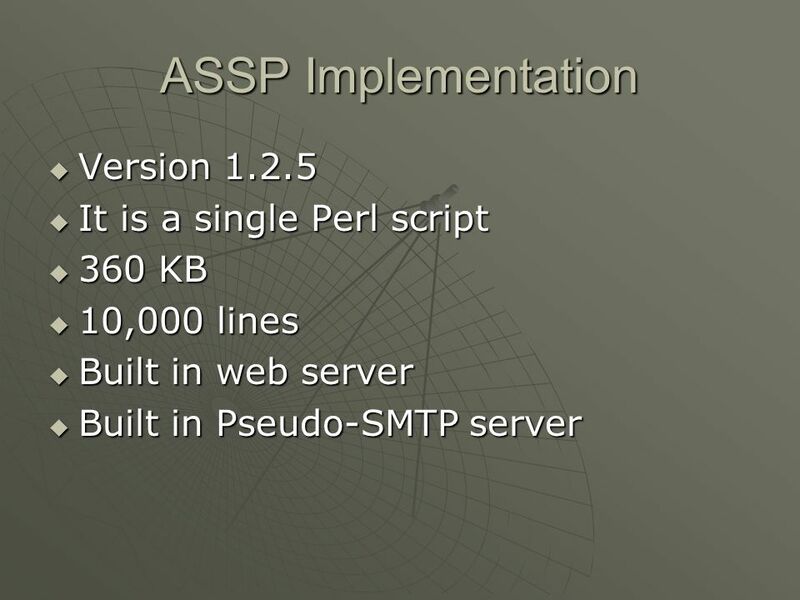 10,000 lines Built in web server Built in Pseudo-SMTP server ASSP is a project on SourceForge.net. 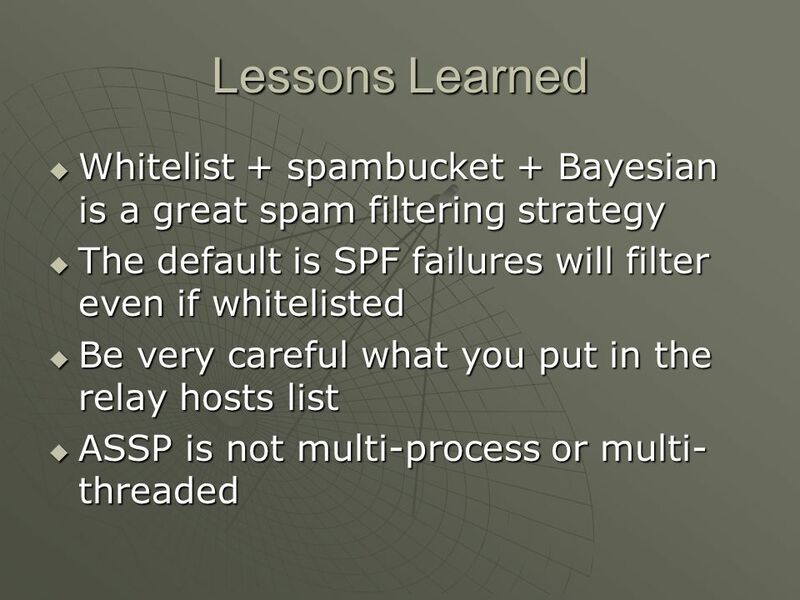 Automatic Whitelisting Spam Traps Bayesian filtering Greylist Whitelist RE Matching interface Mail Analyzer Automatic Statistics SPF (Sender Policy Framework) DNSBL (DNS Black Lists) ClamAV virus scanner Mail host Headers Originally SPF stood for Sender Permitted From and was sometimes also called SMTP+SPF, but it was changed to Sender Policy Framework in February 2004. SPF is an extension to the Simple Mail Transfer Protocol (SMTP). SPF allows software to identify and reject forged addresses in the SMTP MAIL FROM (Return-Path), a typical nuisance in spam. SPF is defined in RFC 4408 Automatic Whitelisting: Outbound is automatically whitelisted assp]# telnet spam 25 Trying Connected to spam.domain.com ( ). Escape character is '^]'. 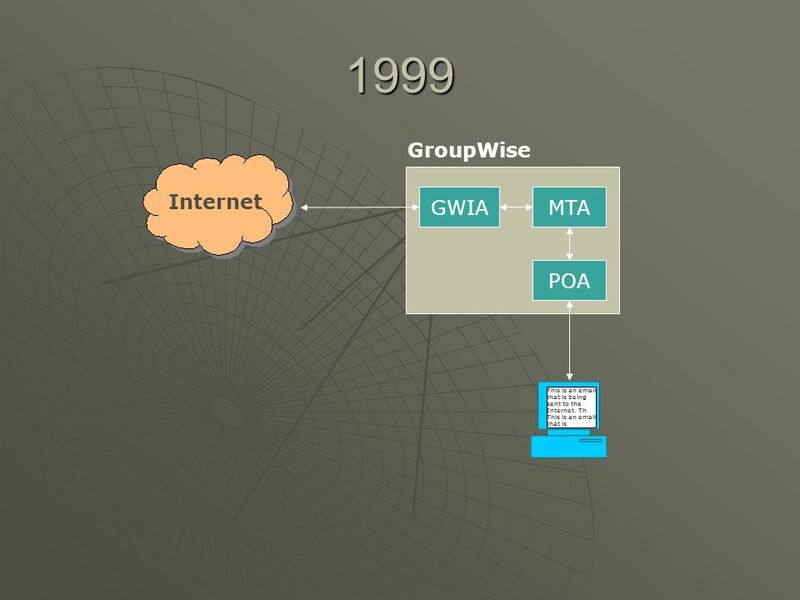 220 .domain.com GroupWise Internet Agent Ready (C)1993, 1998 Novell, Inc. Foremost amongst ASSP's features are: Bayesian analysis, Penalty Box (PB) trapping, RBL (Real-time Black-hole Listing, aka DNSBL), multi-level SPF (aka Sender Policy Framework) validation, SRS (aka Sender Rewriting Scheme) fix-up, Delaying (aka Greylisting), sender validation & recipient validation, multi-level attachment blocking, as well as multiple RFC validation mechanisms. 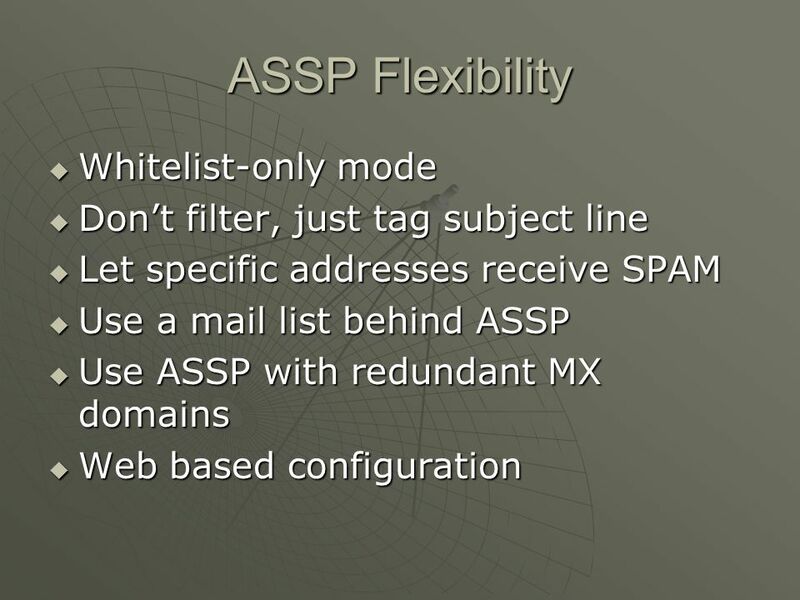 Don’t filter, just tag subject line Let specific addresses receive SPAM Use a mail list behind ASSP Use ASSP with redundant MX domains Web based configuration Spam Lovers configuration option allows ASSP to forward SPAM The No Processing option will skip whitelist additions and will not contribute to the SPAM/NOTSPAM database. Remove Whitelist Entries: Copy the section of the maillog that contains the erronious whitelist addition -- edit it to make sure there's no valid whitelisted addresses in it, then paste it into the "remove addresses" box in the ASSP config -- you don't have to clean out the other text from the maillog -- just make sure the only addresses that appear in what you post are ones you want removed. 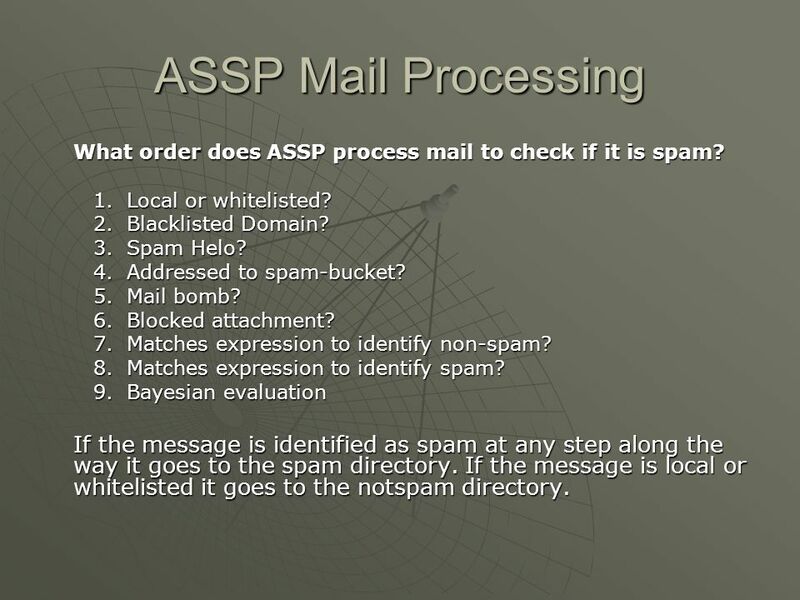 24 ASSP Mail Processing What order does ASSP process mail to check if it is spam? Local or whitelisted? Blacklisted Domain? Spam Helo? Addressed to spam-bucket? Mail bomb? Blocked attachment? Matches expression to identify non-spam? Matches expression to identify spam? 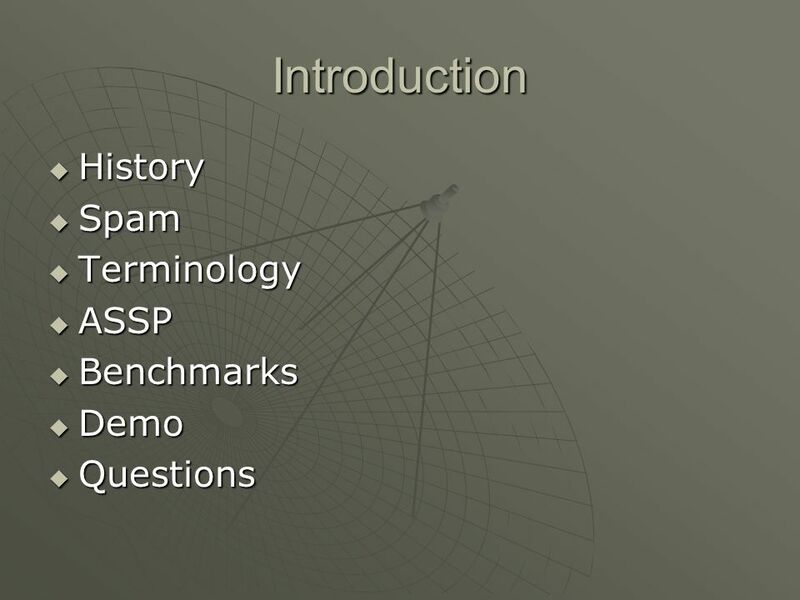 Bayesian evaluation If the message is identified as spam at any step along the way it goes to the spam directory. If the message is local or whitelisted it goes to the notspam directory. 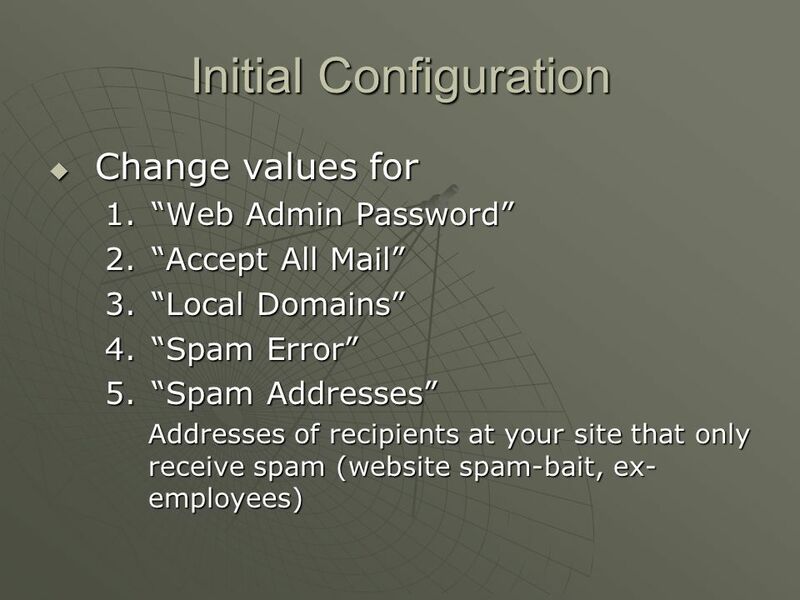 Change values for “Web Admin Password” “Accept All Mail” “Local Domains” “Spam Error” “Spam Addresses” Addresses of recipients at your site that only receive spam (website spam-bait, ex-employees) Remember to press Enter or click the button at the bottom to register your changes – simply clearing a checkbox doesn’t send the change to ASSP. 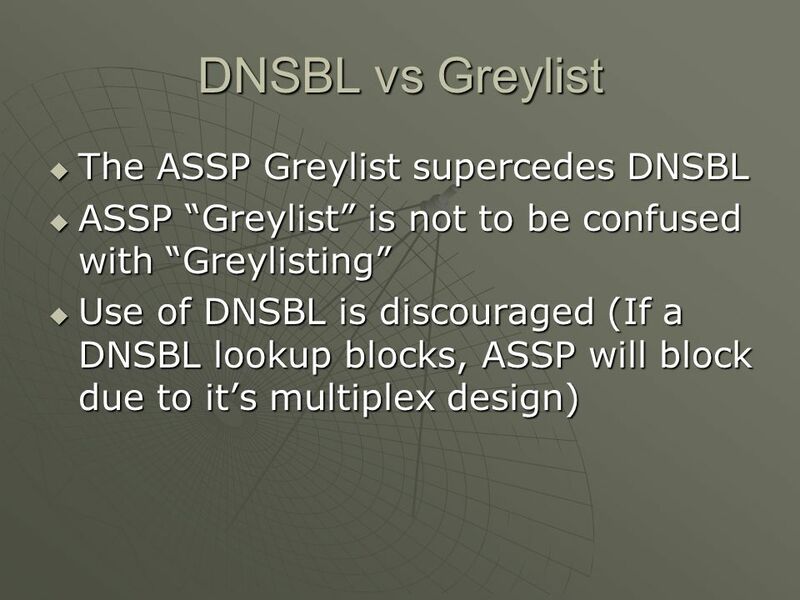 ASSP “Greylist” is not to be confused with “Greylisting” Use of DNSBL is discouraged (If a DNSBL lookup blocks, ASSP will block due to it’s multiplex design) The dnsbl setting has been superceeded by the greylist and is only present to provide backward compatability. Its use is strongly depreciated. But I hear you say, "But I want to block mail from known-bad IP addresses." Can't ASSP do that? 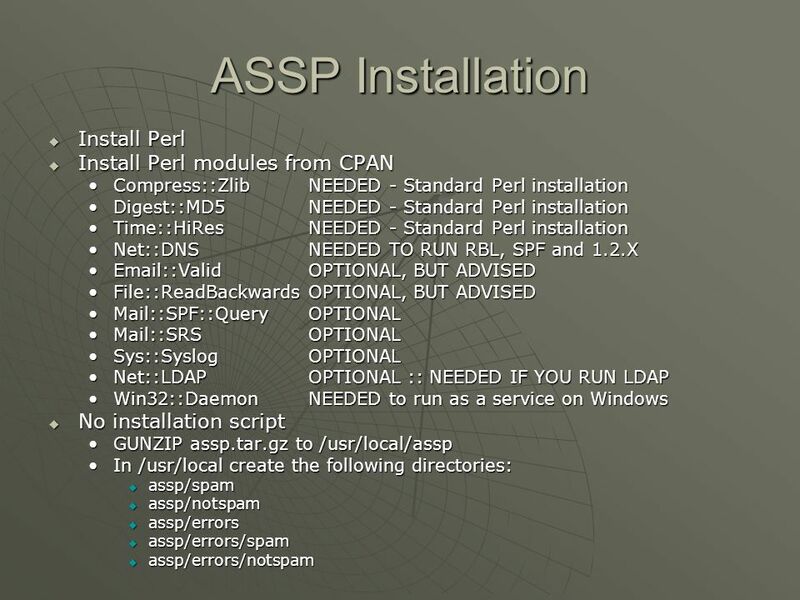 ASSP could do that but that is not what the DNSBL setting was used for. These are the factors involved with DNS black listing and how they relate to ASSP: 1) I used DNS black lists for a number of years before I wrote ASSP. I found that they rejected far too little spam and had far too many false positives. They change slowly, while spammers adjust quickly. There is no such thing as a "realtime" black-hole list. I also found that truely successful black-hole lists either get sued out of existance, become pay (ie for profit) services, or simply go bust too quickly. The bottom line is that an IP address alone does not give you enough information to correctly classify incoming mail. ASSP's greylist is an attempt to make use of what information is available about an IP address without creating false positives or negatives. Perhaps you'll argue that you know of a truely fantastic black hole list, and maybe times have changed and such a thing really exists. If you have one that's > 99% effective, then use it and skip ASSP. If it's less than 99% effective, then just use ASSP and forget about the black hole list -- it's unnecessary and a distraction. 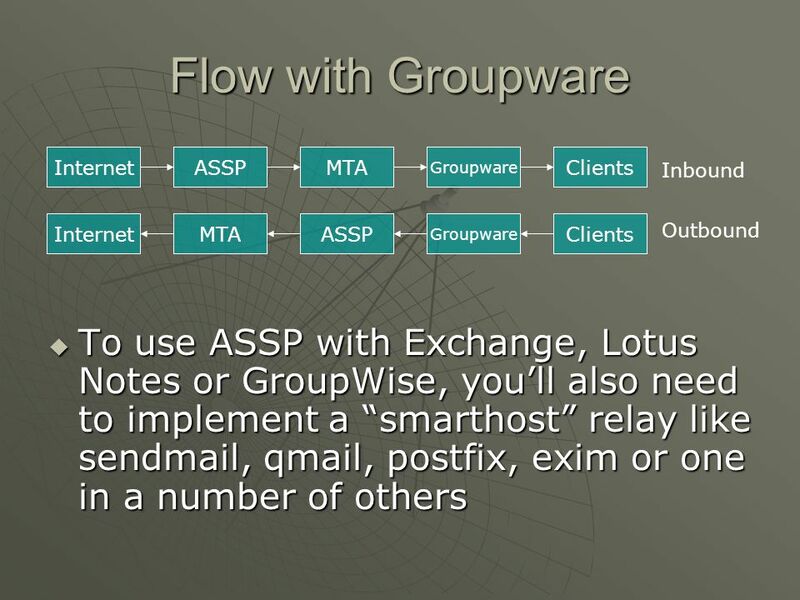 2) ASSP is a multiplexed server, not multi-process or multi-threaded. 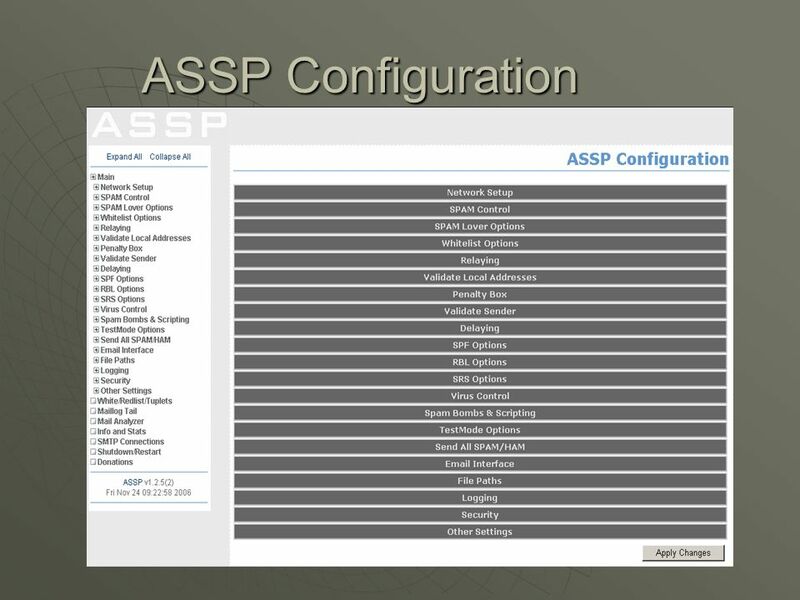 This allows ASSP to be truely cross platform and quite effecient in how it handles connections. Unfortunately it means that any process that blocks will cause a temporary SMTP outage. Perl's standard DNS functions block. This means that traditional DNSBL lookups via DNS are incompatible with ASSP's multiplexed design. The alternative (and the approach in the original DNSBL and that continues in today's greylist) is to load all the DNSBL values into a file where lookups can be made in a timely fashion. However most DNSBL services only provide this option if you can prove that your load is quite high. Or you can use a tool like openrbl and update your file on a daily basis. This ends up being problematic. 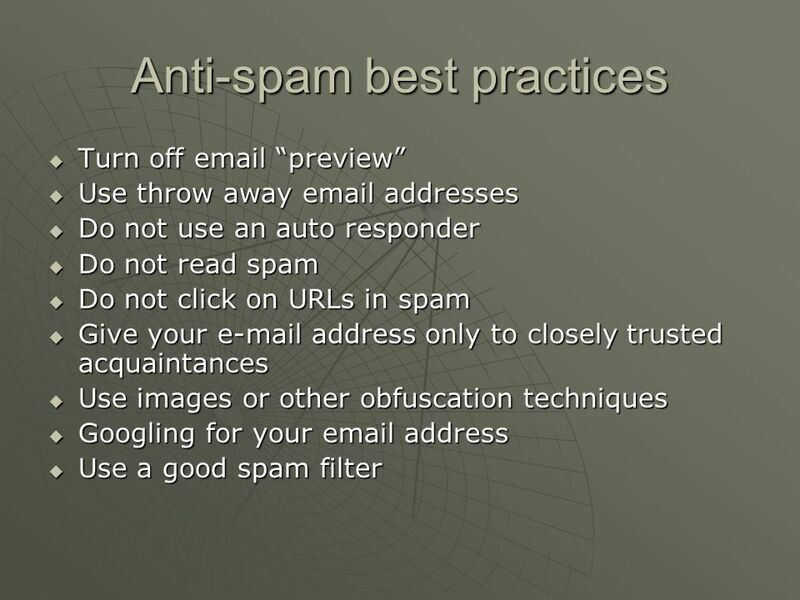 3) "Spam filtering works best by combining a variety of spam-fighting technologies." 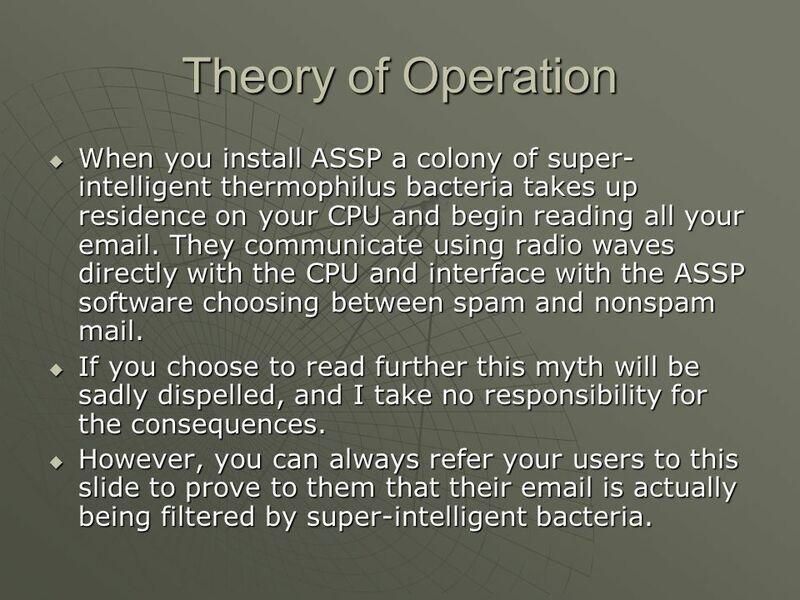 And to the extent that that is true, ASSP incorporates a variety of spam-fighting technologies. However, each technology carries not just a benifit, but also a margin of error and a maintenance cost. You must be careful in combining technologies or you find that you increase your maintenance costs and increase your overall error margin without increasing your accuracy. I believe DNS blacklists fall in this category. 4) Bayesian content filtering is a fantastic tool. Generally the requests I've received from people who want DNSBL support are from those who have used it in the past and haven't used a good Bayesian content filter before. They're trying to keep doing what they've always done before. I'd encourage you to give ASSP a try. See how it performs. I expect that even without DNSBL support it will exceed your expectations in most cases. 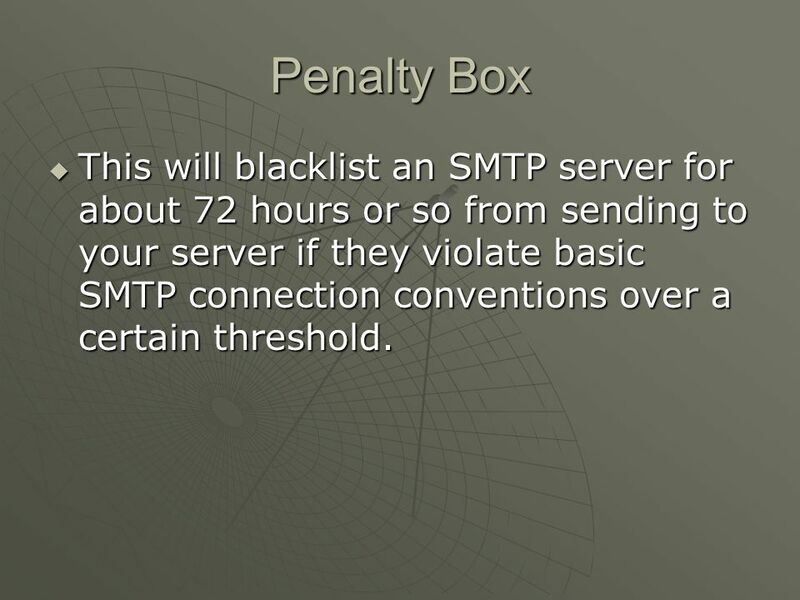 40 Penalty Box This will blacklist an SMTP server for about 72 hours or so from sending to your server if they violate basic SMTP connection conventions over a certain threshold. The Penalty Box is a new idea added to ASSP only recently by Fritz Borgstedt. It is added to from many different tests on the IP, connection, and content. Many of the PB tests are connection based and as such, are very reliable for adding high scores to PB. Some are not; bayesian can add to PB as well. I set bayesian classified s to add 0 to the PB and the same for HELO blacklist. However I add 200 for any IP that uses my own server ID as a Forged HELO, effectively blacklisting them via high PB and later addition to denySMTP file. I also have some addresses that are exploited by malware infected computers spewing spam and viruses. One hit to that address kills their access to my mail server with a high PB score. The Penalty Box database even has a whitelist component that gets added to when an comes from a whitelisted sender or has no spamminess to it. 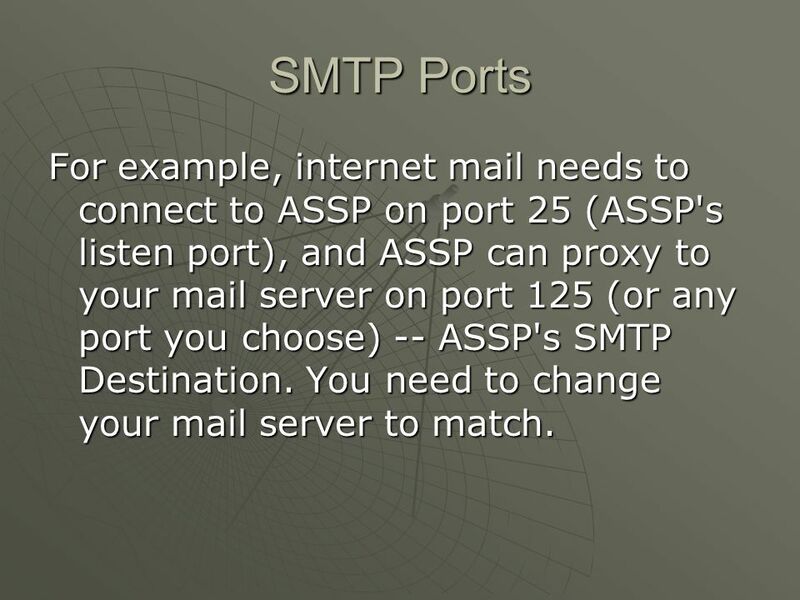 41 SMTP Ports For example, internet mail needs to connect to ASSP on port 25 (ASSP's listen port), and ASSP can proxy to your mail server on port 125 (or any port you choose) -- ASSP's SMTP Destination. You need to change your mail server to match. 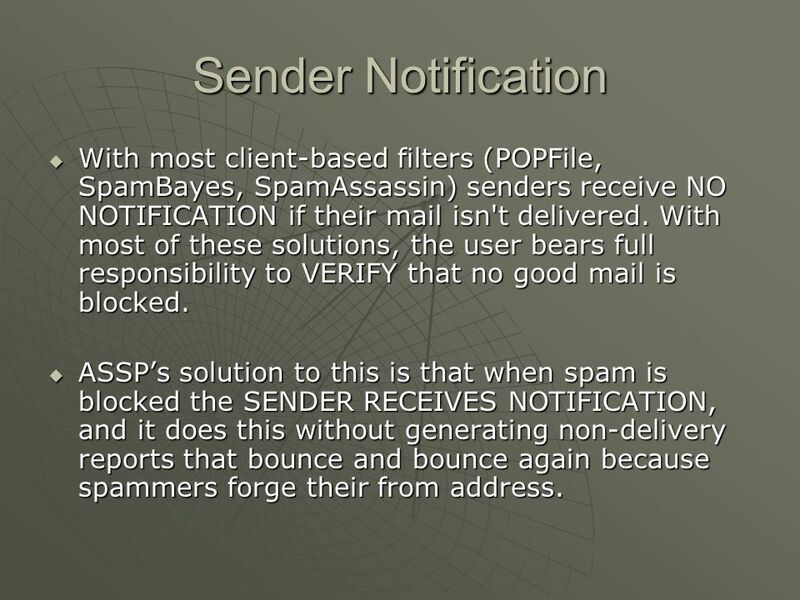 42 Sender Notification With most client-based filters (POPFile, SpamBayes, SpamAssassin) senders receive NO NOTIFICATION if their mail isn't delivered. With most of these solutions, the user bears full responsibility to VERIFY that no good mail is blocked. ASSP’s solution to this is that when spam is blocked the SENDER RECEIVES NOTIFICATION, and it does this without generating non-delivery reports that bounce and bounce again because spammers forge their from address. 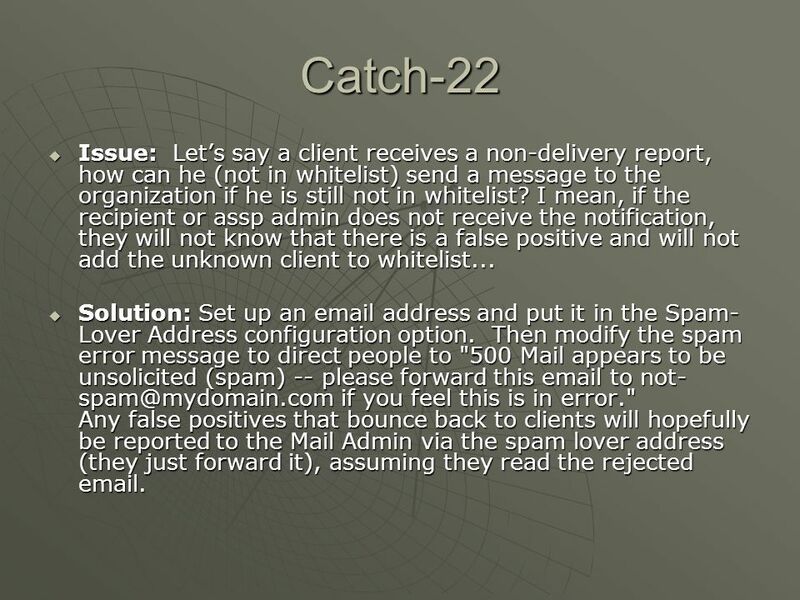 43 Catch-22 Issue: Let’s say a client receives a non-delivery report, how can he (not in whitelist) send a message to the organization if he is still not in whitelist? I mean, if the recipient or assp admin does not receive the notification, they will not know that there is a false positive and will not add the unknown client to whitelist... Solution: Set up an address and put it in the Spam-Lover Address configuration option. Then modify the spam error message to direct people to "500 Mail appears to be unsolicited (spam) -- please forward this to if you feel this is in error." Any false positives that bounce back to clients will hopefully be reported to the Mail Admin via the spam lover address (they just forward it), assuming they read the rejected . great investment in hand-made regular expressions and header analysis to identify spam Hand-crafted expressions are brittle as spammers adjust their strategies Requires frequent updates to accurately identify spam ASSP is low maintenance is easy to install is a complete spam blocking solution, not just a filter that must be integrated into your MTA works with nearly every MTA on any OS Poorly documented > 1. 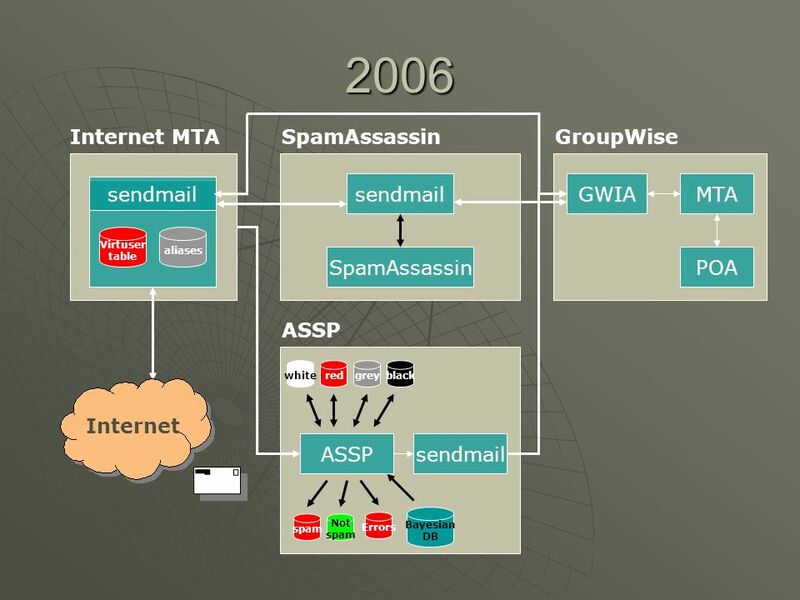 Is SpamAssassin in ASSP integrated no. 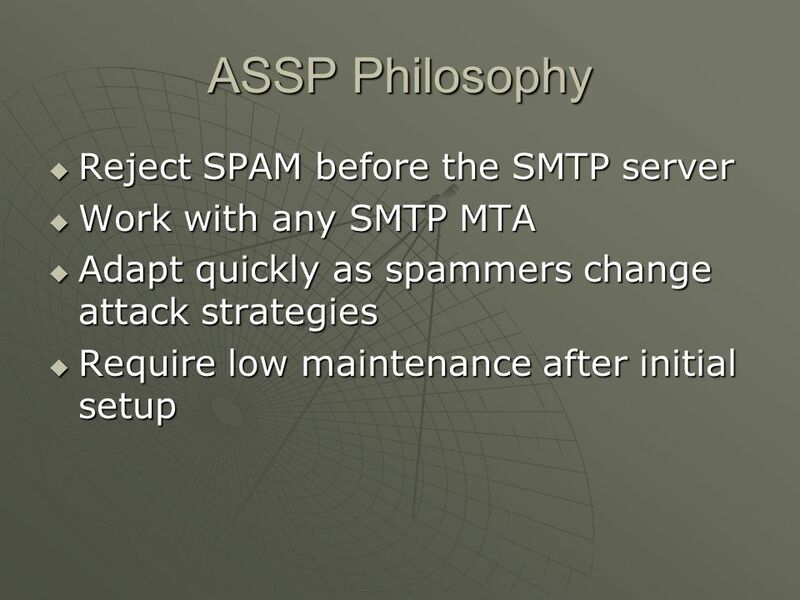 > 2. if not ... why I used spamassassin ( for some time prior to developing ASSP. I found SA difficult to install. It also had to be regularly upgraded. 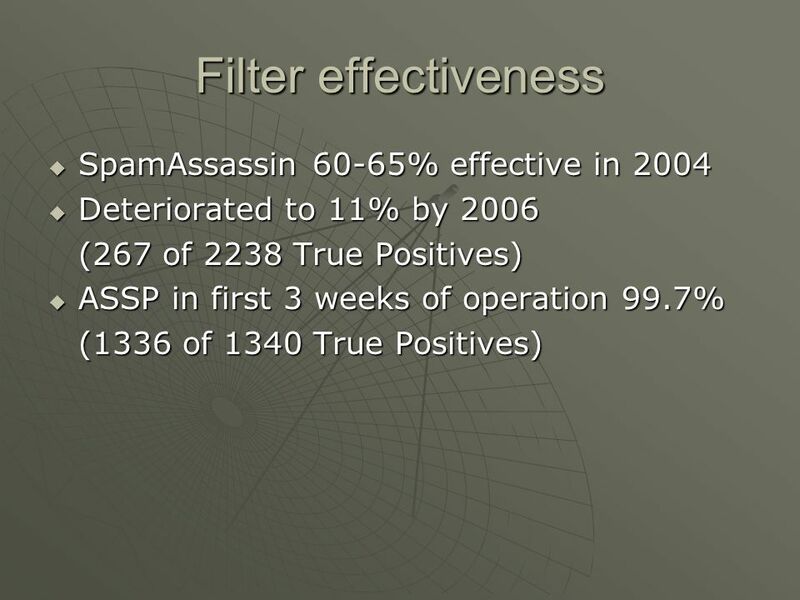 Finally, ASSP's Bayesian filter was more effective at stopping spam than SA. I understand that since then SA has developed a Bayesian component as well, but I'm not completly up-to-date on their development. 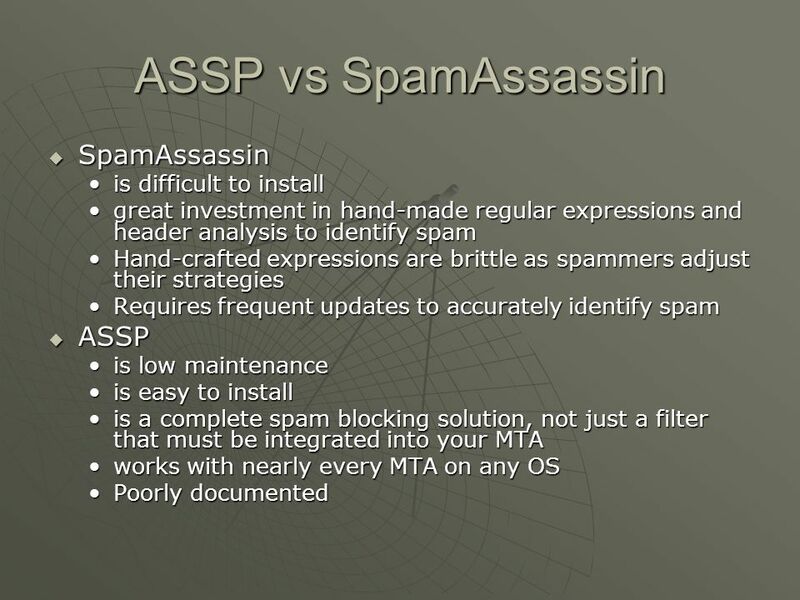 > 3. what are the pros of SpamAssassin compared to ASSP SA has a great investment in hand-made regular expressions and header analysis to recognize spam. > 4. what are the cons of SpamAssassin compared to ASSP These same hand-crafted expressions are brittle as spammers adjust their strategies. 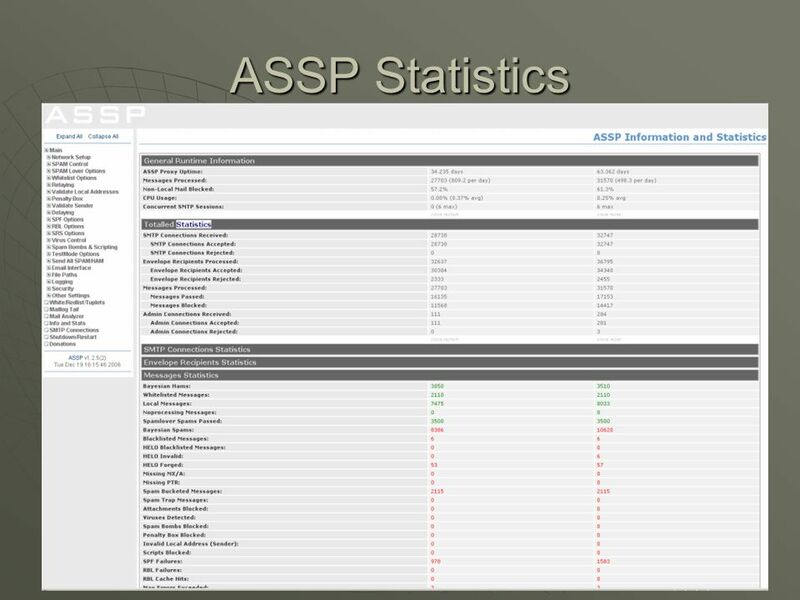 ASSP relies on the flexibility (and customization) from your own site's Bayesian database. 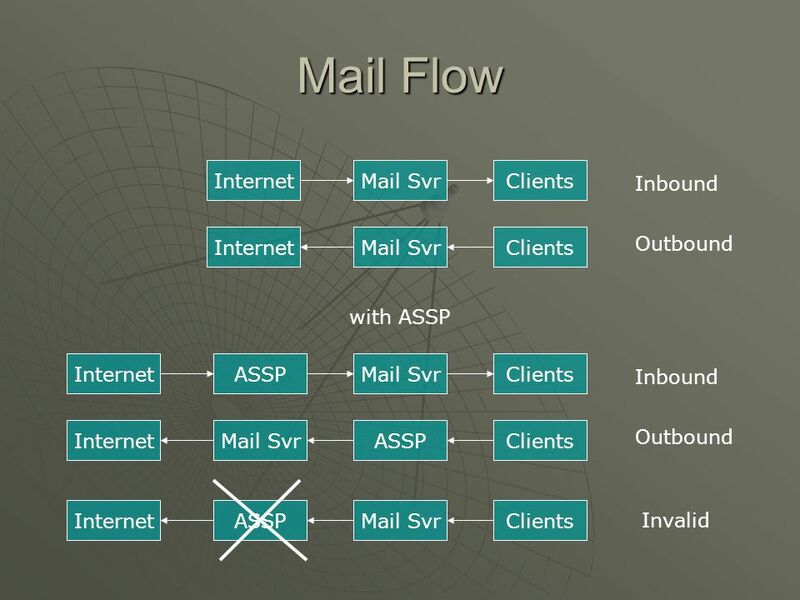 Furthermore, ASSP is a complete spam blocking solution, not just a filter that must be integrated to your mail transport. 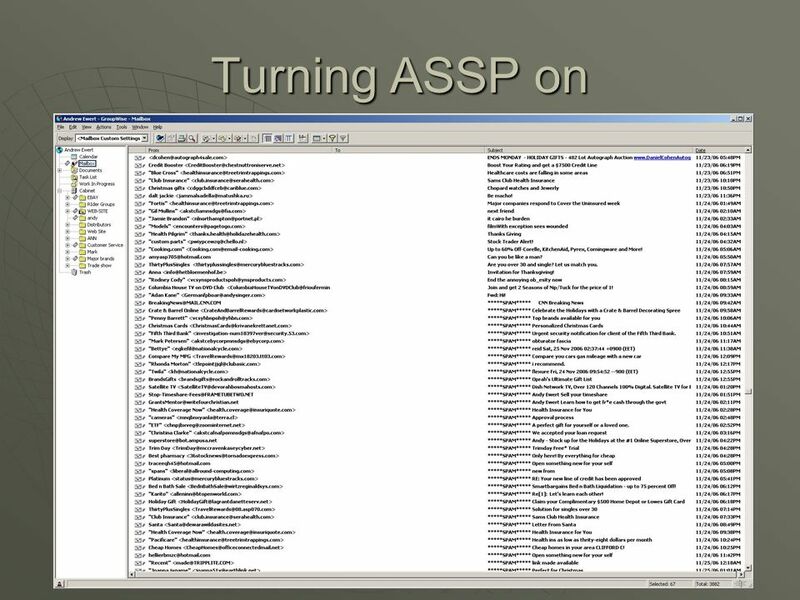 I credit SA with some of the impetus for getting ASSP going -- it is a great tool with a lot of features. 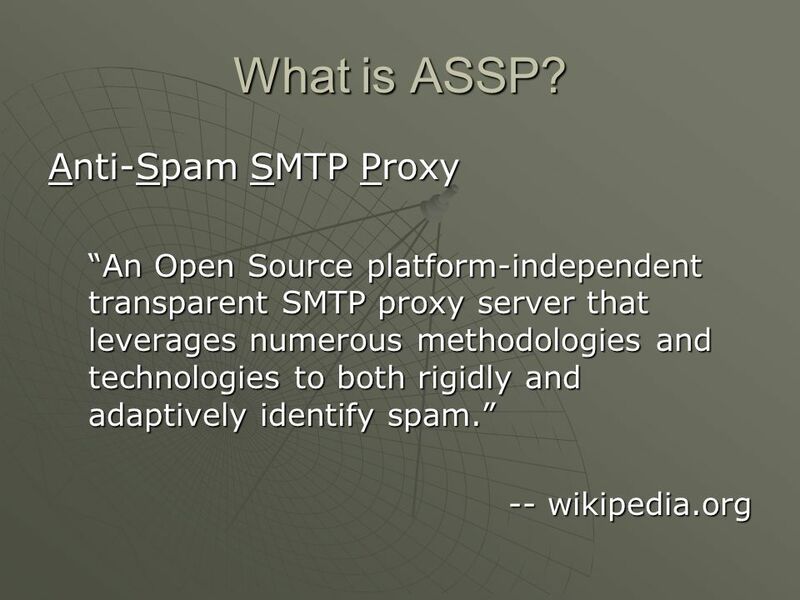 In fact SA's smtp proxy was part of the inspiration for ASSP. 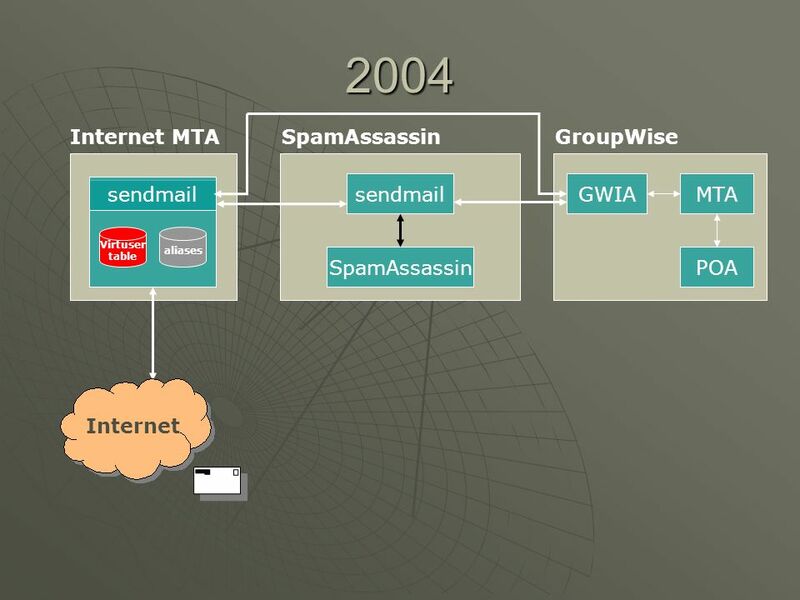 And I would cheer them on -- every effective anti-spam tool reduces spammer's success and makes spam less profitable However, my goal was to have a system that was easy to install, worked unmodified with nearly every MTA on any OS, and I believe ASSP is achiving those goals. Yes, a competant Linux system administrator can probably achieve similar results with SA, but ASSP broadens that opportunity 100 fold. 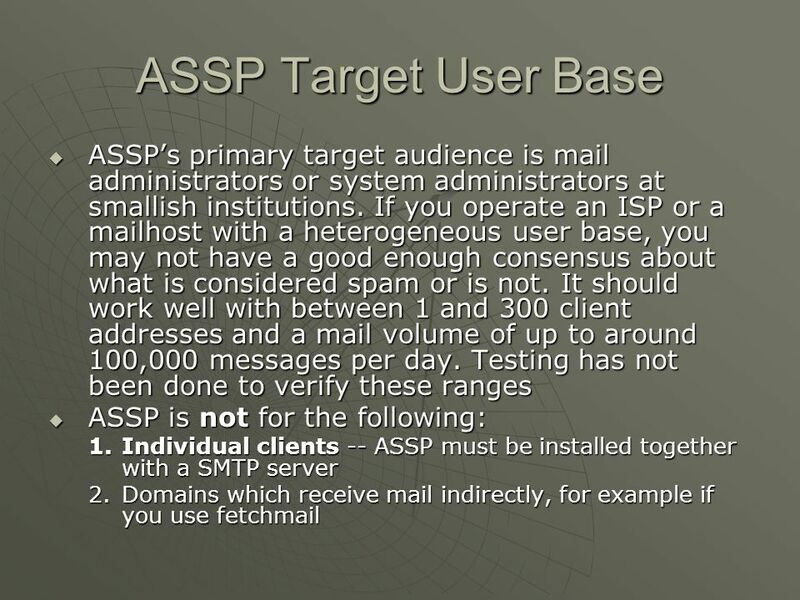 ASSP is site based, not per-user TLS is a form of encryption that allows your SMTP server to have secure communications with the SMTP client. 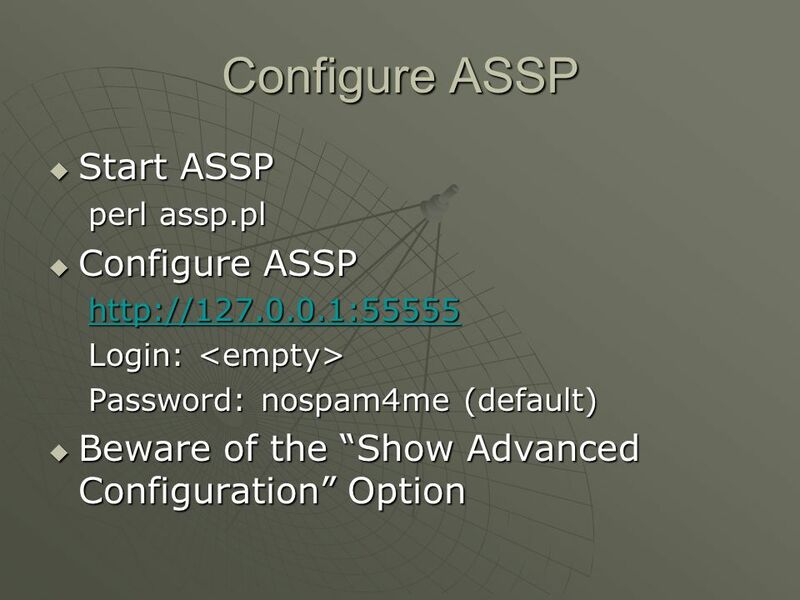 If the communications were secure, ASSP couldn't proxy the transmission to block spam (because it can’t see it) As of version ASSP disables your server's TLS conversations through the ASSP port. 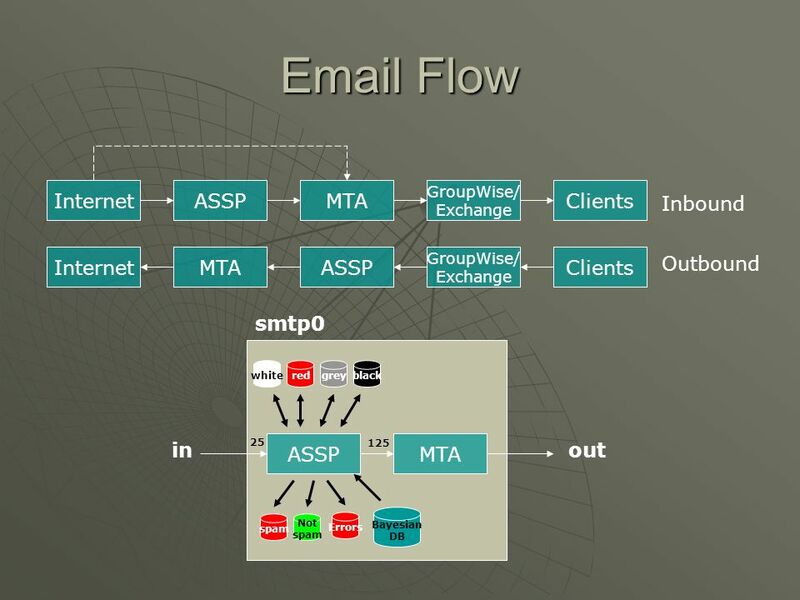 In theory one could use STUNNEL to still allow TLS connections to ASSP and then on to your mail transport. 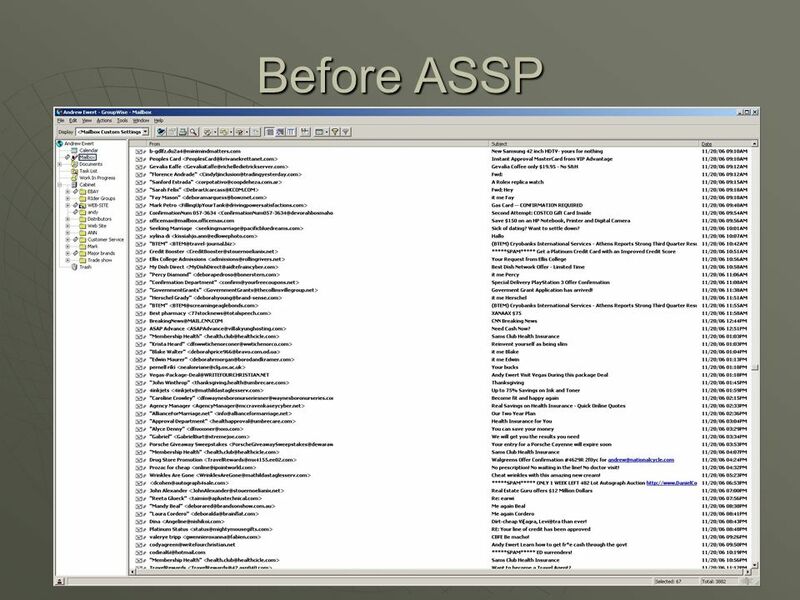 Also in theory one could use a version of openssl to add this capability to ASSP. If anyone does either of these please write me and I'll include it with future releases of ASSP. 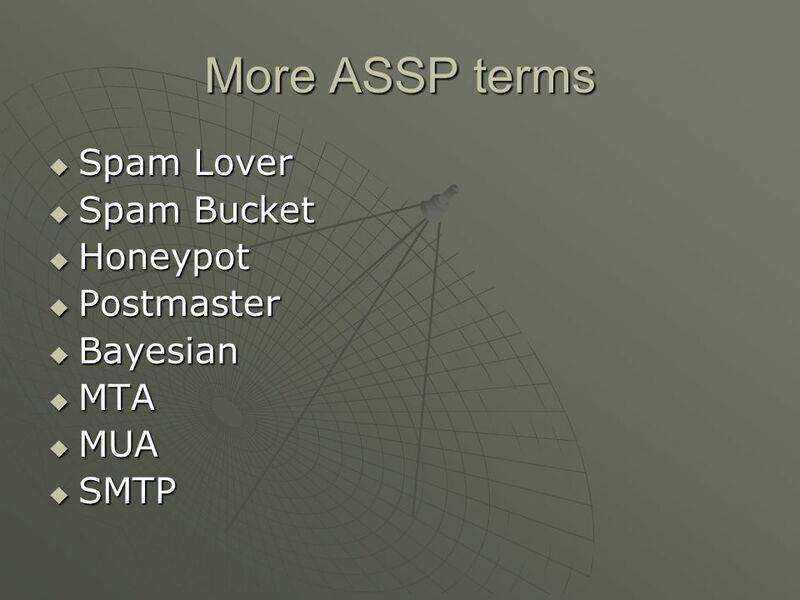 If you have been using ASSP with the UseSubjectsAsMaillogNames option you will find it much easier to identify spam s. However when you are ready to start normal operation you need to rename all these files to numbers so that they get overwritten in time with newer (more modern) spam/nonspam. 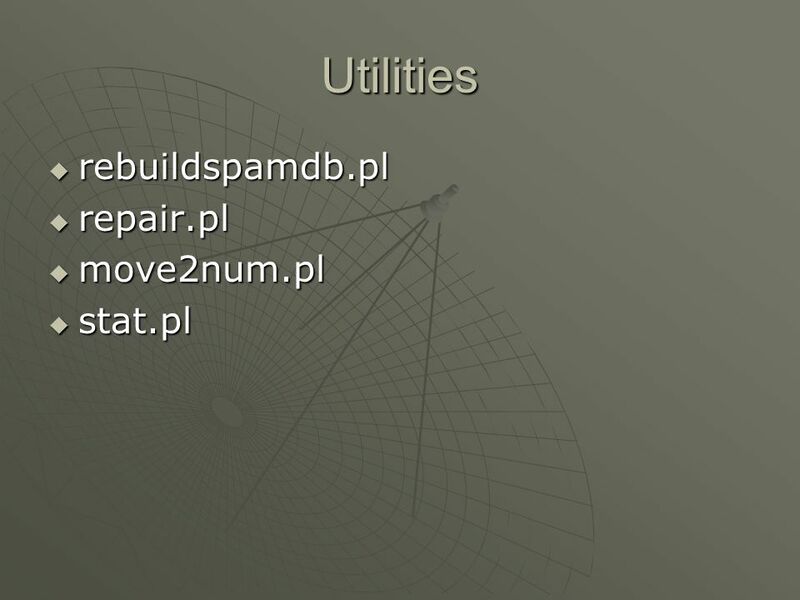 The move2num.pl script accomplishes this for you. You can also use this script if you have manually moved a number of files into the spam/nonspam folders and want to convert their filenames to ASSP's numbers. perl move2num.pl -r Note that ASSP reads all files in the directories irregardless of their name, so numbers or words for filenames is fine. However filenames that aren't numbers will remain eternally in the spam / nonspam folders and never be rotated out. 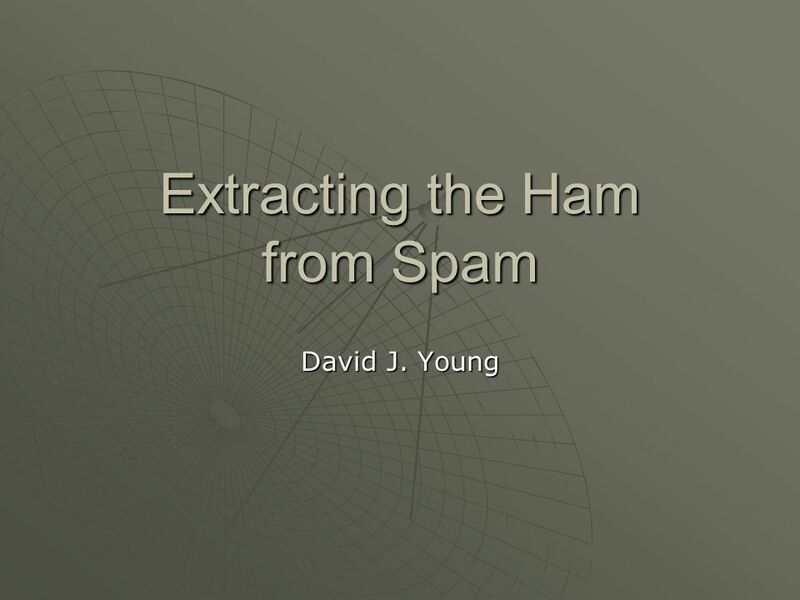 Download ppt "Extracting the Ham from Spam"
What you will get? Or what you like to know? Using Outlook Benefits of Using Outlook Now – Better formatting of HTML mail (with bullets, fonts, etc.) – Great calendar, ability to send meeting. TrustPort Net Gateway traffic protection. Keep It Secure Entry point protection –Clear separation of the risky internet and secured. Web Filtering. ExchangeDefender Web Filtering provides policy-controlled protection from dangerous content on the web. 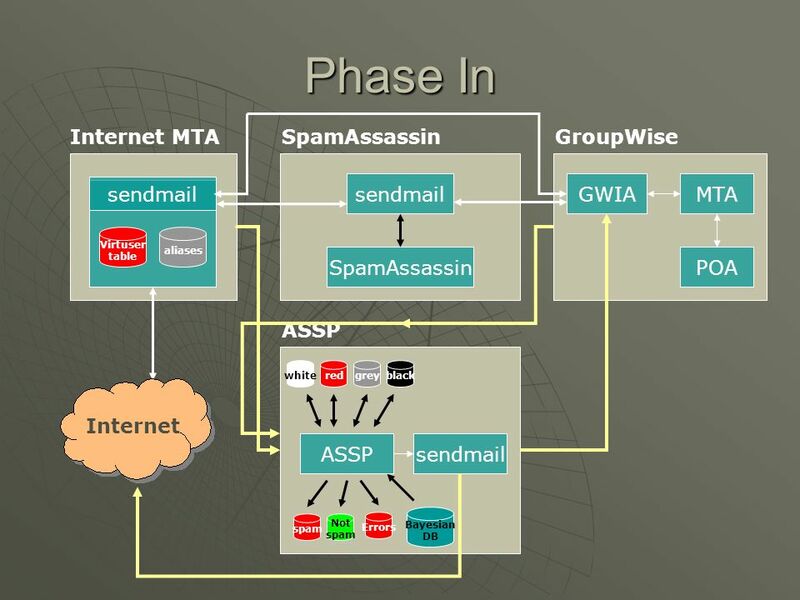 Web Filtering is agent based, allowing. CSS Central: Central Management Utility Screen View Samples Next. Module 6 Implementing Messaging Security. Module Overview Deploying Edge Transport Servers Deploying an Antivirus Solution Configuring an Anti-Spam Solution. 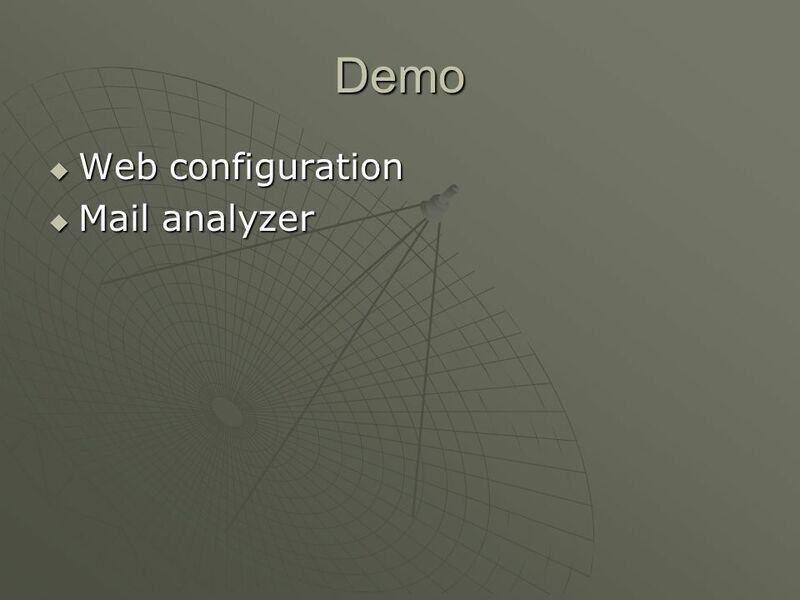 © 2007 Cisco Systems, Inc. All rights reserved.Cisco ConfidentialPresentation_ID 1 VMO and SMTP TOI Aaron Belcher. COMPUTER BASICS METC 106. The Internet Global group of interconnected networks Originated in 1969 – Department of Defense ARPANet Only text, no graphics. 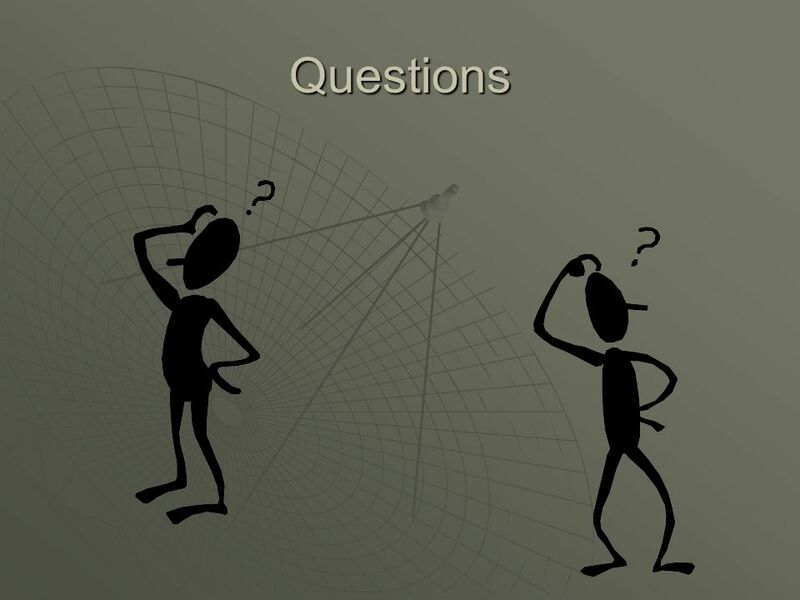 Google Apps: Google Mail Got Gmail?....Need Help? Mrs. Connor.